To return to our main subject. 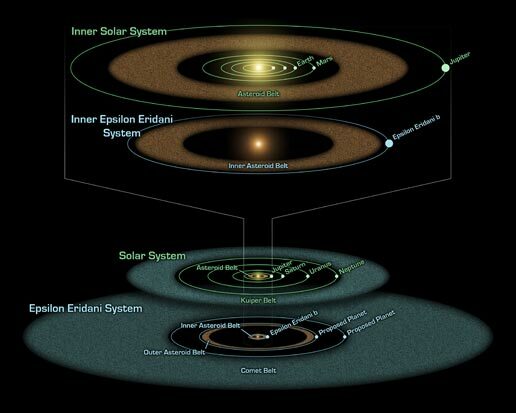 Epsilon Eridani is a young star – its age is often stated as being about 800 million years. This means that any earth-like planet is likely to exist under similar conditions to the age of the late bombardment or perhaps the very beginning of life. It is if particular interest as we may be looking at a star system similar to our own Solar System in the early years of its formation. Epsilon Eridani is somewhat less massive than the Sun and far less luminous (about 30 per cent solar). It is a fourth magnitude star, a mere 10.5 light years away, and is the 10th closest other star system to the Sun. Its rotation speed appears similar to that of the Sun and it displays considerable solar-like activity. Unlike many stars so far found to have planets, Epsilon Eridani is not 'metal-rich', its 'metal content' is actually a bit less than that of the Sun (metallicity about 80 percent solar). It belongs to the spectral system K2 (the Sun is G8). As such its surface temperature is lower than the Sun at about 5080 degrees Kelvin (88 percent). Of very great interest are the results of recent observations.